Interested in taking a Swim England Level 2 Teaching Swimming course? Find out more about this qualification below. – Chris, Level 2 swimming teacher. This qualification builds on your Level 1 qualification and will give you the knowledge, skills and abilities needed to become a swimming teacher. It also includes participation in a minimum of six 30-minute, real-life swimming lessons to gain hands on practical experience. How to plan and deliver inclusive lessons for different levels of ability. Includes adaptations for learners with special educational needs and disabilities. 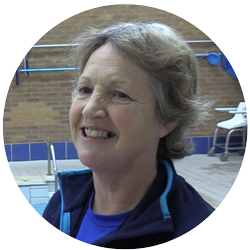 By the end of this course, you will be able to independently plan, prepare, deliver and evaluate a series of swimming lessons. The majority of assessment criteria in this qualification is practical-based. This qualification is not graded. You will either pass or be referred. Once qualified, you can enhance your skills with a CPD. You could also become a pre-school swimming teacher and learn the skills to teach children 5 years and younger. Download the summary specification of the Level 2 Teaching Swimming qualification.